THE ARSENAL CREDO. The Beautiful Game with Beautiful Football. Our heart-stopping win against Leicester/Atkinson made me reflect on why the Arsenal have turned a corner in their efforts to provide the Beautiful Game with Beautiful Football. The past cannot be changed: Wenger could live on his past glories but he refuses to live like Mourinho et.al., jumping ship (or getting fired) when the going gets rough. The putrid pundits and maudlin media constantly write about the time between cup,league, CL and other success but Wenger and his players focus on the future and keep their concentration directed there. Psychologist say that is the best receipe for success in life. Opinions don’t define your reality: Everybody today has an opinion, quite often unsupported or justified by facts and reality. The Arsenal does NOT function on opinions. Wenger rarely comments on officiating or other game issues because he refuses to express his opinion, preferring to deal with the facts and evidence before the supporters. The fickle plastic fanboys line up on websites to express their superior opinions about how the Arsenal should be run and how Wenger has lost he plot…but as they say, opinions are like noses, everybody has one. Everyone’s journey is different: The Arsenal have been constantly criticized for their tactics, transfer choices, managerial direction, supposed monetary frugality etc. However , those criticizing them and holding up flagrant examples of an opposing philosophy quickly neglect the fact that every Club’s journey is different and AFC have chosen the path less travelled, very successfully I might add. Thing always get better with time: Injuries are a case in point. Long-term shortages eventually lead to a glut of returning players who have a tremendous impact a la Welbeck on the weekend! We have a bad game, but we rebound and win the next 6 games. We have a bad start to the season but rebound and in the second half have the best record in the EPL. Our fickle plastic fanboys hate this fact because in their feeble cognitive dissonance, we are only as good as our worst game. Judgements are a confession of character: I love this dictum. Most of our supporters save their judgement for the end of May. The sad mob constantly repeat the same meme; Wenger is no good, get rid of him, spend some money, we have too much deadwood, certain players are knicking a living or aren’t fit to wear the jersey, ad nauseam. This reflects badly on them and inarguably shows their pessimistic, rancorous, infantile and intellectually feeble dependence on others’ (media,pundits) opinions rather than their own eyes. Overthinking will lead to sadness: When I rewatch the games, I try and analyze the tactics and overall strategic development of the game. However, I sometimes find myself getting depressed and worried about what I perceive as individual and team shortcomings. Then I go to Arsenal.com and listen to Adrian Clarke’s astute and expert game analysis and realize that every game is a new experience and can never predict the future…..our fickle fanboys cannot be accused of this failing as they tend not to think at all. Happiness is found within: Tony has written about a supporter who sat near him during some games and whose constant unhappiness and criticism, vitriol and anti-Arsenal mood swings made the game experience rather less pleasant than it should have been. I read about Walter and his Belgian contingent and they seem totally pleased and satisfied with the opportunity to watch the Arsenal, win, lose or draw. They bring their happiness with them, pre-match and celebrate the privilege of watching the Arsenal, regardless. Positive thoughts create positive things: This is the strength and force of UA. 99% of our membership come on here with a positive attitude, even after a defeat. Sure we’re disappointed but we know that days like last Sunday happen more often than losses (56% win ratio under Wenger) and that two FA Cups plus being in the title race this season, plus being in the CL for 16 seasons running are positive things that promise more positive things. The players speak about their belief in Wenger and themselves……and positive things happen because of it. Smiles are contagious: everytime I come on UA, it seems to me I hear smiling people writing their posts and blogs. When I watch AFC videos, they seem to be smiling a lot, even after some hard times. Wenger is NOT the most smiling person and is rather sanguine but he has a wonderfully subtle sense of humour and it makes everyone smile when he uses it. 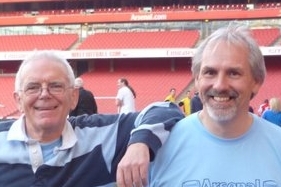 My preferred photo on UA is of Walter and Tony smiling together after their workout on the Ems pitch. Kindness is free: If there is any person who is kinder than Wenger, to his players, the supporters, the media, the officials and the FA……I cannot think of him. He is a father figure to them, a kind and generous, concerned and erudite judge of their welfare. His reward is their eagerness to please him and their commitment to the Arsenal Way. We need to be a bit more kind to each other on UA but in general we are way better than other websites whose raison d’etre (other than demeaning the Club) is to belittle and denigrate those whose opinions do not follow the party line. You only fail if you quit: The Arsenal have the highest number of added-time wins in the entire EPL. We have been written off by the usual suspects every season and yet we may start poorly but inevitably do two things each season, finish above the Spuds (will this season be different?) and win a CL spot. I have rarely if ever seen the Arsenal quit. We are not quitters, unlike the aaa who run and hide when the Arsenal doesn’t meet their dire,negative expectations. Rain or shine we are there for our club and our supporters in the Ems make a wonderful difference. What goes around comes around: When Fergie reigned supreme – all was sweetness and light at Old Trafford. Now there are serious doubts about United. When Mourinho was touted as the greatest thing since sliced bread, Stamford Bridge shone like the sun. Now they walk through the valley of the shadow of death (excuse the poetic license) and are facing a mediocre end to their season. The PIGMOB twist and manipulate EPL results with total insouciance as their acolytes perform horrible imitations of officiating week in and week out. Mark my words UA faithful……their time is coming and the accounting will be severe. Arsenal stayed the course despite difficult years…..our time is almost at hand! Please add any you feel enhance this credo……those who have nothing positive to add can please sod off. * Taken from S.Lipinski’s 12 things to remember about life. Does a Referee’s performance at Arsenal affect the chances of him returning? For years the international press has called for the end of Fifa. Only now are the English media picking up the story. Arsenal in the 70s Part 20: July to Dec 1977 – signs of recovery. 19 February 1997: Arsenal 1 Man U 2. Trial by TV suggested Ian Wright made a lunge on Schmeichel. Police separated the players at the end and Wright alleged racial abuse against him. Eventually both players agreed to end their disagreements. 19 February 2005: Arsenal 1 Sheffield Utd 1. (Robert Pirès scored). Arsenal won the replay on penalties and went on to win the FA cup in the same manner. 19 comments to THE ARSENAL CREDO. The Beautiful Game with Beautiful Football. An excellent post, only enhanced by the title. 3.I was brought up during the Allison era during which his philosophy was “As long as Arsenal are talked about, that’s good news”. 4.The joy, excitement and frustration of following Arsenal has, from time immemorial, stemmed from the Arsenal Way, namely, victory clutched from the jaws of defeat and, in equal measure, just the opposite. Not a mixture for the fainthearted. Ahhh Don! I was all set to award Tipster the 5. then I read the 10 & I suppose it’s a question of being kind to those lost souls, specially in this period of lent. Wish I could write “comically” like that. I would survive longer, especially with the referring where Arsenal FC is concerned! Manfy – I see couple of chikens hiding under the cannon so the Foxes must be in their coop. Corection -Mandy – I see couple of chickens hiding under the cannon so the Foxes must be in their coop. 12 great points, nothing else to add at all. Happy to report that United have shown how dire their season has become, but we have to take into account that they have 11 players out injured (mostly first team)and are doing their best to imitate the Arsenal when it comes to injuries. As long as we at UA and those noble defenders of Football at the football is fixed website, continue our revelations about the PIGMOB, the FA and the corruption rampant in the EPL, then eventually things will happen and justice will be served! What can I say Don? Beutiful nd soul enliven post! Nothing to add, infact, you made my day joyful!Tanx. Some words have been removed from the lexicon, no criticism can be levelled at our leader, bad decisions are good, good decisions are double good. Defeats are good preparation for our delayed and ultimate victories. b)positive criticism about specifics in my article. You think you read……that sums it all up, you don’t know or care whether it is factual or not, as long as it hurts AFc and Wenger. Try crawling out of your burrow and joining the UA community in a positive way…..it is , as I said in the above article, and enjoyable experience. Don’t worry, LeGrove is always there if you can’t take the heat in this kitchen. Perhaps I will, post an article that is, bear in my I may not have the undivided support of this sites bloggers, unlike the vast majority of authors. Preaching to the converted can be easy, the decenting voice though not always welcome, should at least be heard, we’ll see. Maybe we can agree to disagree for now, as for tomorrow, hope we win. No chance Tipster of giving you any grace whatsoever. I don’t have the undivided support of UA members either and a dissenting voice, if supported by rational arguments and some hard, solid research, even if supporting a contrary view, is always welcome.Afterall that is what Ua is all about. I do hope we win and feel we will make it to the final, unless the PIGMOB intervene. @Tipster you love clubs that spend money for success, I’m sure Manchester City or Chelsea would love you as a fan so join them, I’m sure AFC don’t need people like you. To think people on here don’t want Arsenal to win titles or cups is ridiculous, we all want the same thing but here we don’t say oh the manager is sh.t, the players are useless, club has no ambition etc. We support the club whether win or lose, why? Because we are club supporters not glory hunters. 2. AW don’t spend money = money pincher, don’t understand transfer. 8. Players always injured = sh.t medical stuff and facility, weak players. Hope to see his/her article soon. Food for thought? It’s your type that usually say what I wrote above on the Internet, so there are plenty of resources for you to get for your article. In your article could you also please explain why you support Arsenal Football Club and the meaning or difference between a supporter and glory hunter.